rod, bolts & washers. (circa 1980s mainframe computer Hard-Discs) Aluminium coated with Ferrous Oxide. "To Hunt Data in Arcadia"
"Plutonium Tsunami" completed 20/6/2005 W'Shawn Gray. This work a protest as to the dangers of shipping of Plutonium to, then from Japan. 82.5 cm (h) 234 cm (w) 93.0 cm (d). ~ 37 kg. Stainless Steel sheet & bolts, Aluminium & Bronze casting. Mild Steel square bar. "The Demise of the Cognoscenti at the Anti-Rosetta" completed 25/5/2006 W'Shawn Gray. 50.7 cm (h) 55.6 cm (w) 25.0 cm (d). 3.5 kg. Bronze, Stainless Steel bolts, Aluminium bar & casting from an automatic transmission. "Source" completed 28/5/2006 W'Shawn Gray. 25.5 cm (h) 51.0 cm (w) 38.0 cm (d). 6.0 kg. Bronze, Stainless Steel bolts & Aluminium torque converter casting. "Revenge of the Desert Gods"completed 16/10/1993 W'Shawn Gray. 120.0cm (h),75.0cm (w), 85.0cm (d), ~ 15kg. Aluminium & Bronze, bolts Stainless Steel. 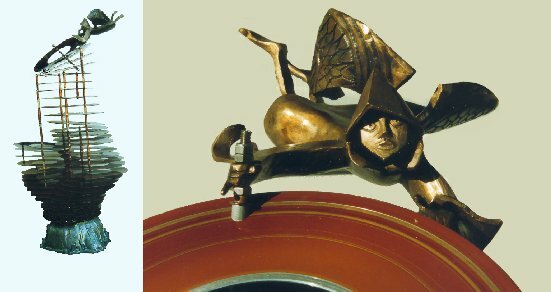 An virtual exhibition of unique bronze sculptures, by me (W'Shawn Gray) . (Virtual Reality) VR Sculptures / Worlds. 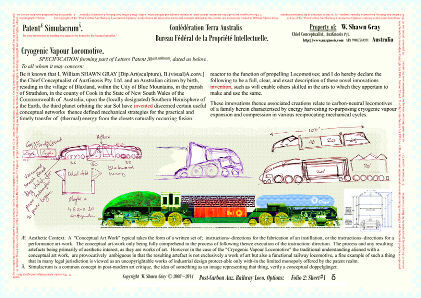 With time-lines and business-cases for the most part beyond common short-term consideration another strategy to safely disseminate the discoveries made while researching Australian Options for Post-Carbon Railway Locomotives was required. Trained as a sculptor / conceptual artist the obvious answer for me then was a conceptual art-work starting with a series of fine-art print-works document the concepts. "ze incomplete Tri-Lingual Sci-Fi" ©. ;- a film story-board, a poem, a comic, in English, Arabic & Chinese. Following the success of my first two experimental tapes;SYMBOLIST DAYDREAM & SPIDERS , I was subsequently invited to submit a new work to an international video festival in Amsterdam that year. Thus the Tri-Lingual Sci-Fi concept began a life of it's own some twenty years ago now. Any & all feedback to the author via email is most appreciated. Thanks.